on behalf of Joseph S. Gober Jr.
Each year, Max & Rubie, the official ambassadors of Americana Vineyards Winery in NY's Finger Lakes hosted a benefit for animals that are less fortuntate than them -- hoping to give them a chance at a better life. Over the last few years, Max & Rubie have crossed the Rainbow Bridge, leaving us pupless, but last year Mav, a rescue from Tenessee and Lil, who was surrendered locally because of medical expenses, made our family complete again. And they immediately took over the duties of hosting Woofstock! This year, Woofstock's 7th Anniversary, Mav & Lil hope to raise $8500 for the local shelters and rescues and to help their 4-legged brothers and sisters who aren't as fortunate as them. For people in the area, it's a day of pet and people fun complete with games, live music, auctions, raffles, food, drink and adoption information. New this year is My Dog's Got Talent Show, with all money raised from it also going to the cause. We will have two Doggo Agility Course timed runs, where you can run your pooch thru the course for a chance to win prizes for being, well, Top Dog. 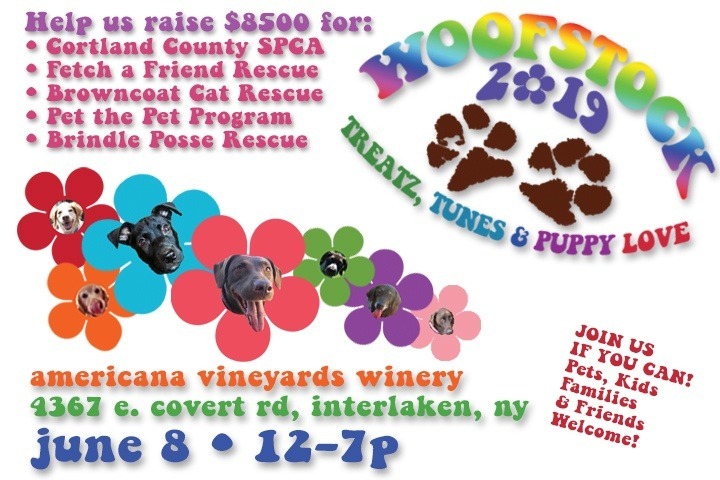 For those who can join us at the winery, bring donations of pet supplies and cash with you and receive Doggone Fun Tickets in exchange -- good for food, games, wine tastings, wine slushies, prizes, auctions, dog talent show votes, the agility course and more. For those of you who can't, but would still like to help us meet goal, you can donate here. 100% of the money and supplies raised goes to the 5 local rescues: Pet the Pet Program, Fetch a Friend Rescue, Cortland County SPCA, Browncoat Cat Rescue and Brindle Posse Rescue. Thanks for helping Mav & Lil and all of us here at Americana carry on Max and Rubie's tradition of giving back to our area's deserving animals, and those who care for them! Don't forget, if you make a donation of $10 or more today through Sunday, June 3, and show your thank you email, you'll receive a free wine tasting at the winery! We are happy to announce the addition of two new well-deserving rescues this year! Cortland Community SPCA and Brindle Posse Rescue from Rochester! Please join us in giving them a helping hand! While we had a great event Saturday, we fell $1200 short of our $5500 goal for 2016. Please help us reach that goal right here. Remember it's for all the pups and kitties who are still waiting for their forever home! To everyone who donated, we have been having some trouble getting the money to transfer out. Please know how much we appreciate the donations and are still working to claim them. Again thank you! To help the local shelters, rescues and animal care programs; We love and support our fur friends that give us endless and unconditional love. Bless them! Thank you to everyone who stopped by our table this year at Woofstock, you made this donation possible!